Yes, everyone’s all time favorite fun food is now in pizza form with this quick and fun-filled recipe for macaroni and cheese pizza! Toss that take-out number and suprise your family with this unexpected mash-up of their two favorite suppers in one easy recipe! I finally did it. I’ve been thinking about it, dreaming about it, hinting around about it, flirting with it, and now I’ve finally taken the plunge. Yep, macaroni and cheese cupcakes and macaroni and cheese soup and plain old macaroni and cheese just weren’t enough….I had to go and make macaroni and cheese pizza. Part of this is my way of coping with the fact that my macaroni and cheese partner in crime, aka the teenager, is off cavorting around at college and having a grand old time, leaving me here to make macaroni and cheese without her. Sniffle. I do have to admit that I posted this next picture on her Facebook wall in a shameless attempt to lure her home for a weekend visit with her mama. There are no lengths to which I will not go to get some quality time with my bunny, who was just in kindergarten five minutes ago…I’m not sure how this college thing snuck up on me so fast. Sniffle, sniffle, sniffle. 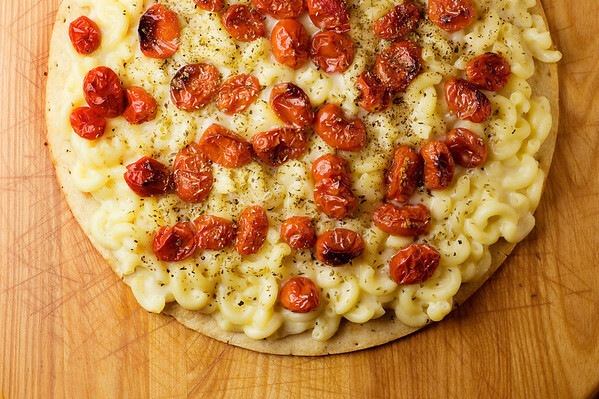 Yes, everyone's all time favorite fun food is now in pizza form with this quick and fun-filled recipe for macaroni and cheese pizza!Click to TweetNext I roasted up a nice handful of cherry tomatoes. I was looking for a little hint of that sweet tomato sauce taste, and regular tomato sauce just didn’t seem right for this pizza. But the little cheery cherry tomatoes were perfect. Now, the key to this pizza is, of course, the mac and cheese. The oven baked kind just won’t work…it’s too thick and dense. Nope, what you want is the creamy, cheesy stovetop variety that you can ladle on to your pizza crust. Scatter the cherry tomatoes on top, shake on some oregano and then pop it in a hot oven for about ten minutes – just long enough for the macaroni to crisp up just the teeniest bit. Then all that’s left is the eating! As you can imagine, this is One Filling Pizza. After one slice, I pretty much felt like I had the macaroni and cheese version of Thanksgiving dinner. And as it turns out, the teenager came home for the weekend last weekend. Coincidence? Maybe…but maybe not! 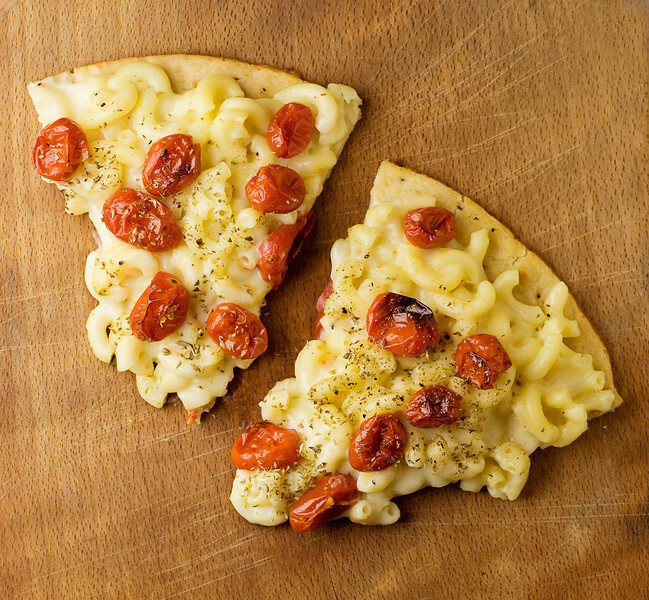 Yes, everyone’s all time favorite fun food is now in pizza form with this quick and fun-filled recipe for macaroni and cheese pizza! Preheat oven to 450 and line a rimmed baking sheet with foil. Toss tomatoes with olive oil and roast for 10 minutes until soft and blistered. Remove from oven and set aside. Meanwhile, cook pasta until al dente, drain and return to pot. Remove sauce from heat, whisk in cheese and stir until cheese is melted. Add pasta and stir to coat. Cool for about 5 minutes, stirring occasionally. Ladle a generous amount of mac and cheese over the pizza crust (you won’t use all of it, meaning you will have leftover mac and cheese, meaning you will be SO happy later in the week!). Scatter the roasted tomatoes on top, and shake on some oregano. Bake for 5-10 minutes, remove from oven, cut into wedges with pizza cutter and serve! for reals? am i reading this right? my fiance would love me forever if I made this! And that picture didn’t lure her home?!?!? Are you sure she’s your daughter? You can lure me over with this any time. I have a 15 year old boy at my house that would never ever leave if I started making this. You just combined his two favorite things!! Thanks for the idea. If my Mom had sent me a photo of this while I was in college, I would have been on her doorstep by the next afternoon wanting a slice. This looks delicious, Kate! I’m sure this will be requested over and over again! Love tomatoes on baked mac & cheese ala Ina Garten’s recipe with gruyere and sharp cheddar! This looks too awesome for words! I think, though, that I will add a wee bit of mozzarella in with the cheddar to make it, you know…more authentically pizza-ish. Have to have that melty, stretchy cheese string on pizza! Thanks for experimenting and sharing the love! Oooh, mozzarella cheese! There’s nothing like that warm cheese taste…let me know if you try it! ARE YOU FREAKING KIDDING ME?! And here I thought pizza and mac n cheese couldn’t be made better. Best part is, even in Japan, I can get all these ingredients (mind you, they’re a little on the pricier side but . . .). When I get the chance, I will totally make this. Btw, long time stalker of this blog, and I copy almost every recipe into a notepad document because so many of the things you make are things I can totally do where I live despite not having an oven or easy accessibility to certain ingredients. I love this blog!